Heat the oven to 375°F. Line 1 baking sheet with parchment paper (When it's time to bake, you will need 1 additional baking sheet and parchment paper). Sprinkle the flour on the work surface. Unfold the pastry sheet on the work surface. Roll the pastry sheet into an 11x14-inch rectangle. Place the pastry onto a parchment paper-lined baking sheet and top with another layer of parchment paper and another baking sheet (This will create a thin, crispy pastry when baked). Bake for 25 minutes, removing the top baking sheet and parchment during the last 5 minutes of the baking time. Remove the baking sheet from the oven and place on a wire rack. Replace the second baking sheet to keep the pastry from curling as it cools. Let the pastry cool completely. Cut the pastry into 12 (3 1/2-inch) squares. 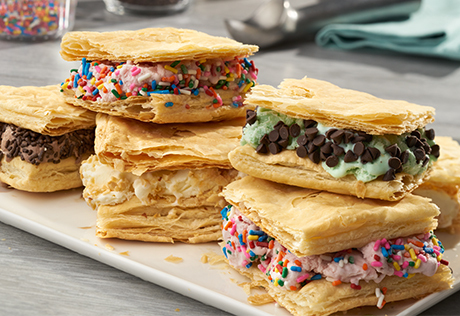 Spread 1/2 cup ice cream onto each of 6 pastries. Top with the remaining pastries. If desired, dip the edges of the sandwiches in sprinkles, chopped nuts, crushed pretzels or whatever you like to coat the ice cream . Place on baking sheets and freeze for 1 hour or until firm. To make ahead, you can wrap the frozen sandwiches (after the 1 hour freeze in the last step) in waxed paper or plastic wrap and store them in the freezer for up to a week.